This Spinning Machine Four Three Quarter is fabricated using premium quality raw material and is tested on various parameters. These machines are used in several industries such as pharmaceutical, medical, plastic and others. They are well known for robust construction and smooth operation. Clients can avail a customized range of machines as per their requirement. These machines are highly appreciated for their features like high performance, less power consumption, robust construction and easy maintenance. Four Three Quarter Spinning Machine 96 Spindle are made as per the customer specification and widely used in many industries. This automatic doffing Silver spinning machine has 96 spindles, 4 ¾’ pitch, bobbin size 7 ½” traverse x 3 ½’’ dia with wharves & Baxter flyer complete with motor & electrical. The spinning frame uses large metal parts which can be assembled in such a way that they spin the fibers well into a yarn. These are made of high quality raw material and are easy to maintain. They are available for market leading price. These Spinning Machine Four Three Quarter 104 Spindles are fabricated using high grade raw materials. These machines are highly recognized due to their reliability and longer service life. This automatic doffing Silver spinning machine has 104 spindles, 4 ¾’ pitch, and bobbin size 7 ½” traverse x 3 ½’’ dia with wharves & baxter flyer complete with motor & electrical. 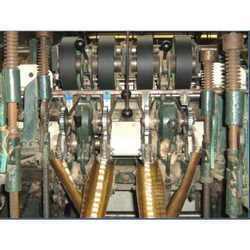 These machines are manufactured using the advanced technologies and available for nominal price. 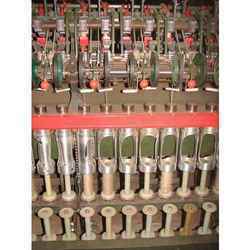 Our range of machines is widely acknowledged for easier operation. Our range of third drawing machines (5 head 20 delivery) is considered to cater to the necessities of varied applications of engineering industry. Third drawing machines offered by us are recognized for offering high ruling and performance. 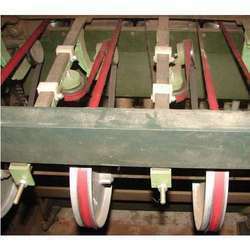 Looking for Spinning Machine Four Three Quarter ?